Why do I accept mediocrity when I could have boundless happiness? Some of humanity’s current truths may be hard to confront, but this is why we, as a people, must look at both our shared fears and our personal fears. studying historical specifics, the crux of seeing our current events as a reflection of our actions becomes a pivotal point of observation. discovered, or when the laziness sets in? Furthermore, what is laziness, but a broad term used to blanket our doubt? Through identification and personalization of our dreams, breakthroughs, and habits, we can root the ideas that serve us, while also, ridding ourselves of those ideas that do not serve us any longer. To see ourselves home and rediscover our faithful footsteps, we must accept all of our reflections— [as we manifest ourselves into the flow of daily patterns connecting the reality of our lives]. Drawing forth from our understanding of reason and rationality, these observed patterns require a consistent (constant) source of mental, physical, and spiritual energy in order to remain in the realm of existence. inevitably – changing face of now. experience that causes our minds to label our existence as life vs. strife. Tracing our emotional memory back to its source, we can move closer into healing the cause of a mistake, instead of attempting to heal its symptoms. And now, I wonder how one puts theory into action? In other words, what drives me? a find of what pulls the heart. To be a living and breathing character of the book of life. once I allowed myself to be found. I had been wading in the comfort of my past. Knee-deep in anxiety with a head-full of far-out ideas, when I realized that the comfort I thought I had been feeling was not comfort, it was paralysis. weirdness in the form of the good ‘ole grateful counterculture. Specifically drawn to the peace-packed hippy movement of the 1960’s, I read about, and I felt about: racial justice, political justice, and the justice of good vibes— that seemed to be right around any corner. However, let us look at where our species wades now. when a writer starts thinking… or stops. Why do we support the current war? What war? Are we that scared of communicating? Am I? and discuss the validity of any reason to this negative rhyme? Huh? stupidity in our passive decisions and agree to never act so silly again. further cultivate our society or destroy it]. The hard part is taking responsibility for the seeds you don’t water. The directions that walk us home. 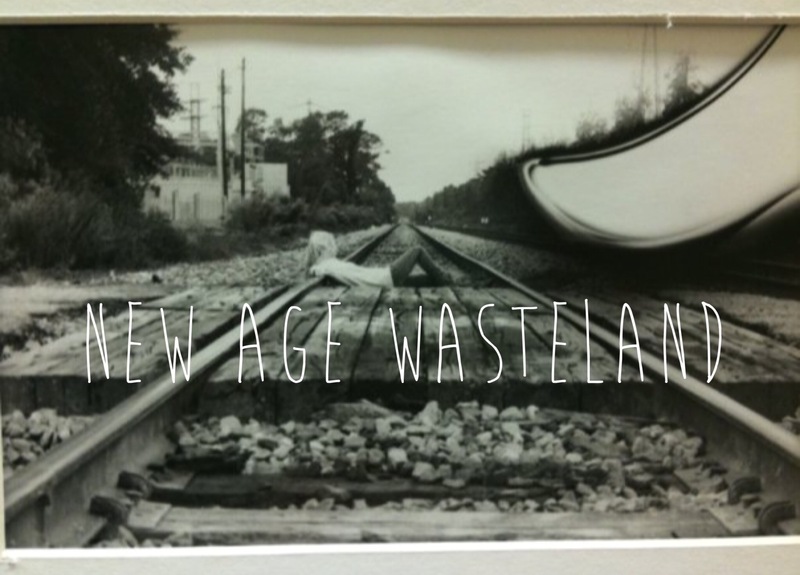 New Age Wasteland (Productions) is an all-inclusive, all-immersive, aesthetic alliance of alternative artistic expression. Positively, founded on the beauty of essence and the essence of truth. It is a collective of voices, reflecting art back onto itself. Branding together in shared reason, shall we stand up for our public airwaves? How can we level the worldwide economic playing field? How can we view our own self-worth as more valuable than money? Together could we create art: music, television shows, films, novels, etc. that serve a larger purpose and a larger population? Could society use (artistic) self-expression to surpass all false misconceptions? Could we collectively create a consciousness that values worth over wealth and character over class? New Age Wasteland is an agreement to aim past your tide’s reach. experience of existence thus far. I am living for joy. I am living for peace. to always keep the consumer in a state of consumption? children’s cartoons point out how using violence and picking fights (with people you do not know and who are different than you are) is a never-ending battle. Like Wile E. Coyote, have we locked ourselves into a routine of confusing the attempted solution with the actual problem? entirely false. We have just chosen to not use our rational thinking, nor use our heart. I am typing on a laptop right now— Think of how difficult it must have been to figure out how to put these little parts of parts of parts together, in-order to mould energy into form. It must have been more difficult than being a rocket-scientist performing brain surgery, and I know there are more comprehensive technological inventions out there, but that is my point. president, no corporation, no institution, and no person has been capable of creating is world peace on Earth. There must be something more to it, because it seems so simple. seems as innate and natural as breathing. So, let’s breathe, and let’s chill out, before we spend all our money buying ACME products, only to come to see that we are fighting our own selves. I will forever remember the 21st century as the era that we finally ended war. calculator” — see how close to these high-risk areas you and your family are. Thanks for joining See-B.S. nightly noose, I’m Ashton Kutcher, stay punk’d America! to test the disaster-delagating-disease and de-evolvement dollar menu special. dingos during darkly dank destines of dying dreams— has been found to cause death and doting, donning, and dilation of the liver. In sports, Wookies, also known as Couch-walkers, have announced they’ve retired. because I am too white to give a damn about climate change. drugging you up with discounted, damnanizing drama, that is guaranteed to conjure up even the lowest of spirits. Rinse, lather, and repeat. Take 1 pill in the morning with a complete balanced breakfast.